String seed beads, liquid silver beads, or other small beads with speed and ease. 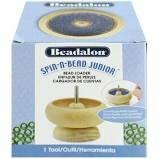 The Beadalon Spin-N-Bead bead loaders makes the tedious work simple. Fill the bowl about half-full of beads, and then spin. Insert a Beadalon Curved Big Eye Beading Needle into the spinning beads and watch them jump onto the needle. The beads nest all on their own - when ample beads are on the needle, then move them to the connected stringing material and dip the needle back into the spinning beads to load on another few-Inch.